Brisbane is now quite well served when it comes to four- and five-star hotels. This is a photograph of the Marriott on Petrie Bight, one of the newest and finest of them. It emerged in 1998. The building that stood on this site for decades prior to the erection of the Marriott was the Atcherley Private Hotel, described below in a couple of ancient advertisements. The Atcherley had several lives, it would seem. As can be seen from the adverts, it was originally an up-market hotel with all modern conveniences for its times. It even had a lavatory on each floor! I can remember it in the sixties, and by that time it had lost a little of its lustre. It was more of a boarding-house then, as I recall. In the 1980s, during the regime of the Bjelke-Petersen government, it was reopened as a casino. Apparently a black-tie event heralded the newest place for illegal gambling in Brisbane, later uncovered and described in detail in the Fitzgerald Inquiry. One can only imagine the degree of graft and corruption that would have allowed such a lavish opening at that time in our history. As pointed out on a recent Criminal History Tour run by the Queensland Law Society as part of Law Week, the pre-Fitzgerald underworld involved gambling, prostitution and out of hours liquor trading. All of those peccadilloes can now be pursued here legally! After the Fitzgerald Inquiry, the Atcherley went to seed. For many years it was an alternative music venue, enabling grunge and punk bands to strut their stuff. Unfortunately the local police felt threatened by young people having a good time, and there were more than a few scuffles at this and other music venues around Brisbane, earning it the scathing nickname of Pig City. The Atcherley was also a squatters' paradise, and skint musos often played there and stayed there too. 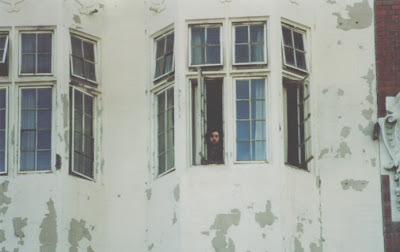 This photo is from a blog, and the author comments on staying at the Atcherley - this is him at a window of the place in 1991. Note the condition of the external walls. The venue played its part in enriching Australia's pop music though - Powderfinger's Darren Middleton recalls playing his first gig at the Stardust Room in the basement of the Atcherley, and other acts that appeared there were the Saints and the Go-Betweens. Ahh the Atcherley. I crashed there many a time in my youth! the stardust room run by glennys. sorry if I spelt it wrong. brent hampstead barman and glassy. had whose who of ol brizvegas on the walls. me well its donny from the clams. great times. clam mobile is leaving in 5 minutes. Gigs of our lives eh? Stayed here as a resident during a yr work visa in 1991. Must say it was only a short stay, boy the cockroaches!! It had obviously fallen into disrepair but seeped it's illustrious past still then. Shame. Full of interesting if not challenging folk! My parents had their wedding reception at the Atcherley Hotel on a Wednesday in 1949. Why a Wednesday I don't know. Maybe there was a lower cost for the use of the facilities midweek.